Toop&Toop Blog: Investors, the most important question to ask your agent... "Am I compliant?" Investors, the most important question to ask your agent... "Am I compliant?" Earlier this month we had two unrelated incidents where a fire broke out at one of our properties under management as well as one of our own offices after hours. In both cases, all it would have taken was a matter of moments for it to have been a dramatically different situation. We are very fortunate that apart from some very shaky tenants and community members at our office, everyone came away unharmed. What really hit home across our team is how differently things could have gone. It could be life changing for an investor if your smoke alarms did not go off in an emergency and something happened to your tenants. What's become clear over the past two weeks is that it seems for a lot of investors, compliance is an unknown quantity. There is uncertainty as to exactly what is required and as a result it becomes a very emotive and worrying topic. 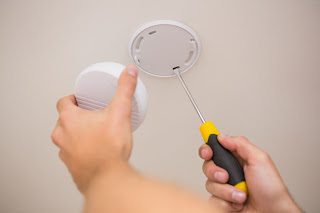 We know that State legislation says all SA homes must be fitted with a working smoke alarm. The expectation is quite clear but it is the testing component as to whether the alarm is 'working' where varying views have emerged. Some investors take a more practical view, that pressing the button or replacing batteries is sufficient, where others feel best practice requires annual checks as well as fire blankets, buckets and fire extinguishers. Further adding to some investor's angst is the idea that they are getting ripped off or that an agent is benefiting from this new buzz word 'compliance'. Based on the number of man hours and resources that have gone into running this initiative within our own business over the past two weeks, I can personally vouch that this is a huge job, and your agent would not be doing it unless they cared. We have dedicated significant resources to it and other projects (such as those in our Innovation Lab) have had to take a back seat for a few weeks. That said, if you are unsure, definitely ask your agent to get some comparable quotes. There are a number of providers in the market and before putting together our compliance packages we met with a number of companies from across Australia to obtain the most competitive prices for our clients. Times are certainly changing and the expectations on landlords are increasing, not just here in Adelaide but across the country. We are finding that compliance discussions are fast moving away from an upsetting deduction on an end of month statement, to a factored in, sophisticated practice of risk management. Ensuring compliance isn't something that has dropped to the bottom of the 'to-do list' is what matters here. It is a big task for any agent to drive this but one we feel is too important to let slide. Now really is the time to ask... "Am I compliant?"